When it comes to your teeth, we are sure that you want them to be as healthy as possible. Anyone who has suffered from tooth pain of any kind understands that while it may seem like your teeth are able to handle quite a bit of use, occasionally they need our help in order to be as healthy as they possibly can. At Balboa Victory Dental, we have been helping Encino area residents for years with their oral health needs and, in today’s post, we wanted to cover one of the services that we cover: endodontics. This service has helped many people find relief from pain and, in our opinion, is one of the most important services that we offer. Continue reading below to learn more! What Differentiates Endodontics From Regular Dentistry? Endodontics is a branch of dentistry that deals specifically with diseases and infections that affect the dental pulp and its supporting structures. Dental pulp can be thought of as the “core” of the tooth. Made from living connective tissue and cells called odontoblasts, the dental pulp is responsible for making sure that your tooth is supplied with the vitamins and nutrients that it needs in order to remain healthy. When the dental pulp becomes compromised, a slew of oral health issues can occur including infection and tooth decay. While many people will seek the help of a dentist in cases where they are suffering from endodontic pain, often times, these dentists will refer their patients to an endodontist because these professionals are better equipped to handle situations of this sort. 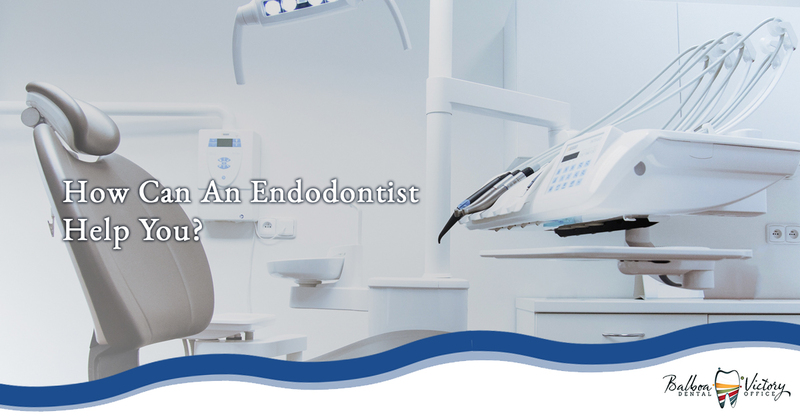 An endodontist is simply a dentist that has undergone a minimum of two years of postgraduate training after completing a traditional four year dental program. This training allows endodontists to better deal with diseases of the dental pulp and diagnose facial pain and associated issues that are a result of dental pulp issues. While you may think that you have no idea what endodontic treatment is, chances are you’ve heard of at least one treatment related to the field of endodontics: root canal therapy. When dental pulp becomes infected, often times the only course of action is to perform a root canal in order to clean out the infected tooth and give it a chance to recover. During a root canal, an endodontist will drill into the infected tooth, remove any infected dental pulp, ensure that the root of the tooth is healthy enough to nourish the actual tooth, and then seal the tooth with a filling in order to protect the root from outside infection. While root canals are not the most popular of procedures among the general populace, they are a necessary treatment in ensuring that the patient does not suffer from the potentially horrible side effects of an infection of the gum. When Should You Seek Endodontic Treatment? If you would like to learn more about our endodontic services or you would like to schedule an appointment at our office to seek treatment, please contact us today or visit our website. At Balboa Victory Dental, we have in-house endodontists that are here to make sure that all of our Encino area patients are able to handle any issues that may arise. Don’t let a small issue turn into a big problem, contact us today and let us help you make sure that your teeth are as healthy as possible.